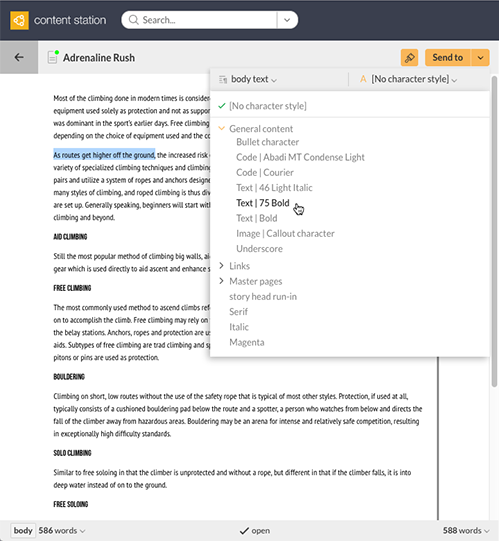 The Styles panel in the Print editor of Content Station 10 is used for applying a paragraph style or a character style to text in an article. Figure: The Styles panel is used for applying styles to text in an article. The styles that it contains originate from the article template on which the article is based when it was created. Step 1. Check-out the article in InCopy or InDesign. Step 2. Make the changes to the paragraph styles and/or character styles. Step 3. Check-in the article. The changes will now be available when editing the article in Content Station.